IMG_6786, a photo by aghrivaine on Flickr. Had a crappy day? 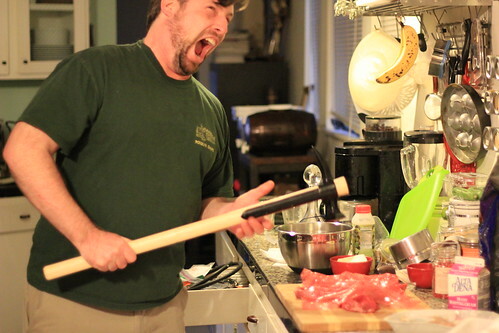 Pounding the dickens out of meat with a warhammer not only relieves stress, but results in something delicious to eat! Seen here - the initial stages of Tournedos de filet mignons poivre rose ala Bourdain. I failed in my goal to cook every dish in the book in a year, but I'm still plugging away at the total. Updates to follow.